In this scene, Peeta’s just given Katniss more food from their basket from Haymitch and then mentions the tarts they make at the bakery, no doubt from Prim’s Goat Cheese because at one point, Katniss mentions that Prim always puts aside two of her cheeses for him and in exchange he gives her a generous amount of bread. 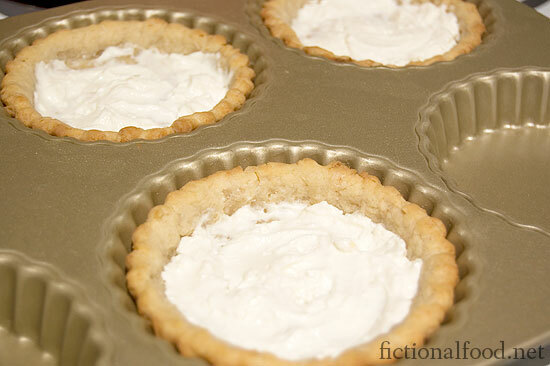 I’ve never made tarts before and I bought a Williams-Sonoma pan just to make these. I followed this recipe because it was simple, but in the end I found that the crusts were just way too dense and it was like swallowing plaster. I will definitely try this again with a different crust, hopefully one that’s crispier and flakier. I padded the goat cheese into the bottoms and then layered on apples that were tossed with honey. It was a bit hard getting a nice design with the apple slices since the tarts are so tiny, so I’ll have to experiment again. I didn’t care too much for the overall taste, probably because I don’t usually like tarts in the first place and the goat cheese tasted a little odd with the apples and honey. I’ll keep you guys posted on another attempt later! After all, I can’t justify buying a pan like that and then only use it once! This was actually the last reference to food in the book, if you don’t count the glass of orange juice Katniss receives after the Games. 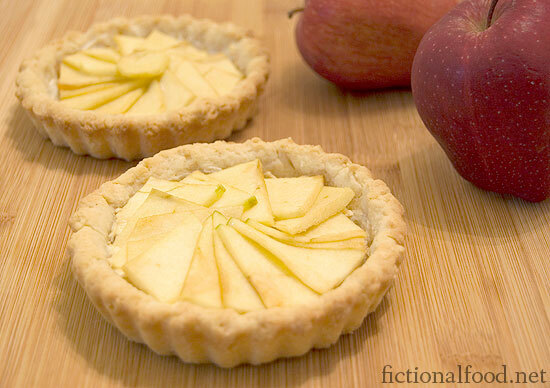 UPDATE: Please see my recipe for Mellark’s Bakery Goat Cheese and Apple Tarts.